As the spacecraft Rosetta approaches a "rubber ducky" shaped comet for the closest comet observations ever made, the spacecraft's instruments are already gathering data that may lead to new insights about how these heavenly bodies form, and how they evolve in their repeated orbits around the sun, says University of Maryland astronomer Lori Feaga. Rosetta, an international mission launched by the European Space Agency in 2004, is slated to become the first spacecraft to orbit a comet up close and observe it in detail as it travels towards the sun. After a ten-year journey, including nearly three years in deep-space hibernation, Rosetta is now about 60 kilometers (37 miles) from its target, comet 67P/ Churyumov-Gerasimenko, known to mission investigators as C-G. The comet is hurtling through an ice-cold region of space some 525 million kilometers (326 million miles) from the sun, and will make its closest approach to the sun in August 2015. Rosetta is due to come within 10 kilometers (6.2 miles) of C-G in November, when it will attempt to drop a lander for the first-ever observation of a comet from its own surface. The orbiter and lander are carrying 20 specialized instruments, and the mission is designed to observe C-G for a year or more. Feaga, a UMD associate research scientist, and Michael A'Hearn, an astronomy professor, are co-investigators working with an instrument called Alice, an ultraviolet spectrograph that is sending back the first observations ever made of a comet's surface in far-ultraviolet radiation, which cannot be detected by telescopes that rely on visible light. Developed by Southwest Research Institute (SwRI) in Boulder, Colo., Alice is providing sensitive, high-resolution data from the comet's surface. By viewing a comet up close in far-ultraviolet light, investigators hope to gain new information about this comet's gases and ices, and to learn more about the evolution of comets in general. Sometimes referred to as "dirty snowballs," comets are primordial fragments of the materials that formed our sun and its planets. First discovered in 1969, C-G has orbited the sun many times and has already burned off much of its original gas and icy material, says Feaga. Earlier observations revealed C-G's size, about 3.5 by 4 kilometers (2.2 by 2.5 miles). 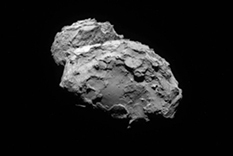 But since July, when Alice and other instruments began mapping the comet's surface daily, it has become apparent that C-G has "two distinct lobes, shaped like the head and the body of a duck," says Feaga. Astronomers used to think that bi-lobed comets, the product of two comets colliding or of geologic processes similar to erosion, were rare. But as researchers observe more comets with better instruments, "we're seeing more of these bi-lobed shapes," Feaga says, "and we're realizing how many close encounters comets have had with each other over time." As Rosetta gets closer to C-G, Alice and other instruments will show whether there are any variations in color between the two lobes. A color comparison "will show us whether C-G is made of two pieces that formed at the same time in the same place, and were fused together in some cosmic collision back in the early stages of the solar system," Feaga said, "or whether they formed much further apart and collided gradually, later on, without any great catastrophe." Alice's mapping has shown that the comet's surface is unusually dark, deeper than charcoal-black, when seen in the ultraviolet spectrum. Because C-G is too far away for the sun's warmth to turn its water into vapor, researchers would expect to see water in the form of patchy ice on the comet's surface. But so far, Alice has not detected large patches of ice made from water on the surface. "We're a bit surprised at how little evidence of observed water-ice it shows," says Alan Stern, an associate vice president of SwRI's Space Science and Engineering Division and Alice's principal investigator. Alice is one of three NASA-funded instruments aboard Rosetta, and NASA's Jet Propulsion Laboratory is managing the U.S. contribution to the international mission.